On March 22, 2016, the National Labor Relations Board (NLRB) General Counsel, Richard Griffin, issued Memorandum GC 16-01. The memorandum instructs NLRB regions to submit cases and issues, which are listed in the memorandum as special concern or interest to the General Counsel, to the Board’s Division of Advice so the General Counsel’s office can provide centralized consideration before taking action. The memorandum sets forth a laundry list of subjects that the General Counsel considers the NLRB’s priorities through 2016. For non-unionized employers the list includes several initiatives in which the General Counsel is seeking to change and expand Board law. Weingarten Rights in Non-Unionized Settings. Since the Supreme Court first extended the right to representation to union employees in National Labor Relations Board v. J. Weingarten, Inc., 420 U.S. 251 (1975), the NLRB has changed its position four times as to whether so-called "Weingarten rights" extend to non-union employees. In the most recent decision addressing whether "Weingarten rights" extend to non-union employees, the Board ruled that non-union employees do not have the right to have a co-worker present during an investigatory interview that might lead to discipline. See, IBM Corp., 341 NLRB 1288 (2004). The General Counsel has announced that the NLRB is looking for cases where employees in non-unionized settings are denied their request to have coworker representatives present in workplace investigatory meetings that might lead to discipline. Assuming the NLRB is able to find the right case, it is likely the Board will reverse IBM Corp. and extend representation rights to non-union employees – returning to the Board's prior position in Epilepsy Foundation of Northeast Ohio, 331 NLRB 676 (2000) and Materials Research Corp., 262 NLRB 1010 (1982), where the Board first extended “Weingarten rights” to employees in a non-union workforce. The General Counsel is looking for cases to expand the Board's decision in Purple Communications, Inc., 361 NLRB 126 (2014), to allow employees access to electronic systems beyond the employer’s email systems for activities covered by Section 7 of the National Labor Relations Act, which includes both the right to organize and the right to engage in protected concerted activities (e.g. group discussions about employee terms and conditions of employment). The Board’s decision in Purple Communications applies only to employer provided email systems. However, the Board did indicate that other employer-provided electronic communication systems (i.e. instant messaging or texting systems, or employer social media accounts), “may ultimately be subject to a similar analysis.” The Board also left open the question as to whether it would consider overturning precedents limiting employee use of employer phone systems for Section 7 purposes. Once again, assuming the General Counsel can find the right case, the Board is likely to expand the Purple Communication decision to a broader group of employer provided electronic communication systems. The National Labor Relations Act excludes independent contractors from its coverage. Notwithstanding, the General Counsel is looking for cases in which the Board may argue that misclassification of employees as independent contractors would violate Section 8(a)(1) of the National Labor Relations Act. In addition to the misclassification allegations, the regional director's complaint asserts that Intermodal’s managers improperly made threats of job loss if employees supported union activities, interrogated employees about their union support, and promised more work if they refrained from supporting a union. Based upon the General Counsel’s stated priorities, it appears the NLRB is taking the position that misclassification of workers as an independent contractor in and of itself constitutes a violation of the National Labor Relations Act. A hearing on the complaint is scheduled for June 13, 2016. Intermodal Bridge Transport v. International Brotherhood of Teamsters, Case No. 21-CA-157647. The General Counsel is also looking for cases to assert that employer English-only policies violate Section 8(a)(1) of the National Labor Relations Act. Consistent with the General Counsel’s stated priorities, an Administrative Law Judge in Valley Health Systems, LLC, Case Nos. 127147 (2015) ruled, in a case of first impression, that a healthcare providers “English- only” rule violated employees’ rights under Section 7 of the National Labor Relations Act to engage in protected “concerted activities,” which includes the ability to discuss and communicate about wages, hours, and other terms and conditions of employment (in their native language). The General Counsel’s complaint asserted that hospital’s rule was so overbroad, that it inhibited employees, particularly non-native English speaking employees, from being able to freely communicate (in their native language) about working conditions and/or other terms and conditions of employment. In response, the employer argued that its rule was compliant with the EEOC’s guidelines regarding “English-only” rule since its purpose was to maintain hospital efficiency and minimize disruption in patient care by employees speaking in languages other than English. The Administrative Law Judge rejected the employer’s argument, and found the rule was not justified by business necessity. Relying upon Lutheran Heritage Village-Livonia, 343 NLRB 646 (2004), the Administrative Law Judge found that employees would reasonably construe the hospital’s “English-only” rule to restrict them from engaging in protected concerted activity. More specifically, the Administrative Law Judge found the hospital’s rule was akin to rules that infringe upon an employee’s right to engage in “negative speech” and “negative conversations;” that the rule was vague as to time and location (i.e., must use English in patient and non-patient areas, in patient access areas, and between employees, staff, customers, patients and visitors), and that it infringed on an employee’s ability to freely discuss and communicate about work conditions, wages and other terms and conditions of employment (in their native language). The Administrative Law Judge also failed to see how patient care would be disrupted by the hospital restricting employees to speaking only English in non-patient care areas and even between employees, staff, visitors, and customers, particularly if a non-native English-speaking employee desires to converse with another non-native English speaking employee about their respective working conditions. On May 5, 2016, the Board affirmed the Administrative Law Judge’s ruling regarding the hospital’s “English-only” rule. Valley Health System, LLC d/b/a Spring Valley Hosp. Med. Ctr., 363 NLRB No. 178 (May 5, 2016). On May 24, 2016, the employer filed a Petition for Review of the Board’s Order with the Ninth Circuit Court of Appeals. 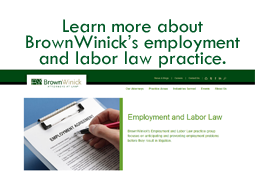 Employers need to remember that the NLRA applies to both union and non-union companies. Employers should be aware of and monitor developments of the NLRB General Counsel’s stated policy priorities. Employers should continually review their Employee handbooks to ensure their policies are not over-broad and infringe on employee rights protected by the National Labor Relations Act. Should you have any questions about the National Labor Relations Act and protected concerted activity or Employee handbooks, contact your own legal counsel or any of our Employment& Labor Law Practice Group members.